HinesLab EyePlay™ is a perceptual technique for architectural use to make buildings appear to warp while moving past them, ideal for theme parks or modern art museums to create a thrilling illusion, or for businesses to attract customers. A possible scenario: Theme park guests board a train at the main street railroad station and head into a green area with their view initially obscured by trees. Then the view clears to give them time to absorb the warping effect before passing more trees. The buildings are built with perspective vanishing points at the height of the riders’ eyes. The walls that would be expected to get narrower through motion parallax appear to expand in width creating a reverse-depth illusion. The zigzag face of the building is angled like fan-folded paper, with the depth exactly opposite of its appearance, with tall edges farther away, and the short edges closer. EyePlay™ combines 2-point perspective with architecture. Essentially, a fake building is drawn on a real building, so that all “horizontal” lines converge at vanishing points at the height of the viewer’s eyes. Fake shadows can be created with darker brick, stone, or paint, and fake reflections can be created with darker glass. A front elevation view of the building made of angled walls. EyePlay™ buildings have functional interior space with horizontal floors and vertical walls. 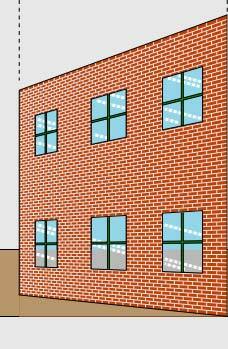 The architecture and materials are the choice of the architect however this illustration uses brick because of the strong perspective cues. The look of brick can be created by scoring wet cement on the structural wall, and then the surface painted the color of brick with a roller. Conventional glass is installed in rectangular window frames from the interior just behind the façade of the structural wall. Doors open inward. The darker color of the “shaded” middle wall, and the “shadow” on the right wall are done with darker paint. Ivy makes an effective camouflage ground cover because it is available in various sizes which can be planted to enhance the reverse-depth illusion (large leaf in the distance, and small leaf up close). 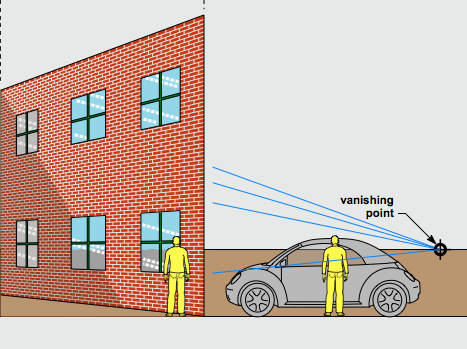 When a viewer walks or rides past the building, the building appears to warp due to unexpected reverse motion parallax, as shown in the top animation. The illusion provides an additional benefit to theme parks and modern-art museums with gift shops that can sell miniatures of the buildings, and souvenir folding cards. HinesLab is actively seeking licensees to commercialize this technology. This is not a product being offered for sale to end users. Theme park companies, property developers and architectural firms are invited to contact Steve Hines to arrange a demonstration with a tabletop model, and to discuss a license. Currently, an exclusive license remains available for a theme-park application.